< A well-made trailerable mooring cover will be designed to fit the boat tight and snug all the way around. A mooring cover is most often what is meant by the more general term "boat cover." A mooring cover will cover the entire boat all the way around, to just below the rub rail, protecting it from the UV rays of the sun, rain and water damage, damage from birds or small animals, and other debris. A mooring cover is usually the best type of cover to use for off-season storage of your boat, or whenever you won't be using it for a period of time. Mooring covers can be purchased "off the shelf," for the make and model of your boat, or you can have a custom mooring cover fabricated especially for your boat, for uncommon boats or to accommodate special options, additions or modifications you may have made to your boat. If you will be trailering your boat, be sure to get a mooring cover designed for trailering. Good trailering mooring covers will fit the boat snugly all the way around and will be designed for tight-fitting tie down, to prevent fluttering of the cover on the highway. 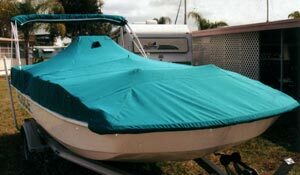 A trailerable boat cover will usually also have extra reinforcements and padding in areas likely to chafe. Many pre-made, aftermarket mooring covers are not made for trailering; they will not last as long, and could damage your boat. For covering boats stored outdoors, a center pole should be used with the cover, to raise the center area of the cover and prevent water and debris from collecting there. Some boats may need 2 boat poles, one in the cockpit and one in the bow. The pole will usually have a snap at the top, with a matching snap in the cover, so that pole can't slip out of place. The cover should not only fit the boat as it comes from the manufacturer, but should be designed to accommodate any aftermarket products or modifications to the boat, such as a bimini frame or fishing rod holders. For trailering, mooring covers should be tied down with straps or ropes, not bungee cords, in order to achieve the tight tie-down needed for safe trailering and to prevent damage to the cover or boat.